Alternative business structures (ABSs) will create additional demand for legal services outsourcing (LSO) and could in time become LSO providers themselves, a new book has predicted. 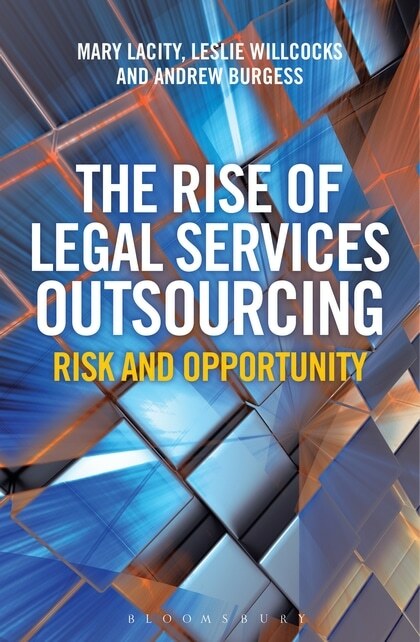 The book – The Rise of Legal Services Outsourcing – saw this as part of LSO providers moving up the ‘value chain’, with new types of organisations emerging that will blur the “delineated boundaries” between law firms, in-house legal teams and LSO providers. It was written by Dr Mary Lacity and Dr Leslie Willcocks of the London School of Economics’ outsourcing unit, and Andrew Burgess, a director of outsourcing advisory firm Source. Their overall message was that in-house legal teams and law firms cannot ignore the fundamental changes to the legal profession caused by globalisation, disruptive technologies and deregulation. “Clients must at least consider LSO,” they wrote. “We acknowledge that there are presently many obstacles to overcome and new competencies to master. The authors said that LSO is likely to mature in a similar way, starting with the shape of in-house legal teams changing from a pyramid to a diamond by replacing the “heavy bottom of the pyramid” with LSO providers. They will also conduct more panel reviews, reduce the number of law firm partners, and increase bundled legal services, while law firms will respond with their own low-cost operations or by partnering with LSO providers. 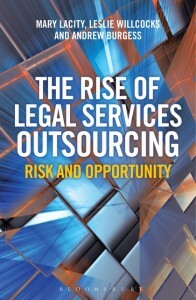 While outsourcing is initially driven by lower costs available through labour arbitrage, with clients comfortable sending less complex and critical work offshore, the experience from other sectors indicated that LSO will start to be used for more complex and important work, the book said. The authors concluded that while they were “bullish” about the future of LSO, it will likely have its share of “failures and disappointments”. Even in the more mature ITO and BPO markets, around 16% of contracts result in failure and 25% see no change in performance. 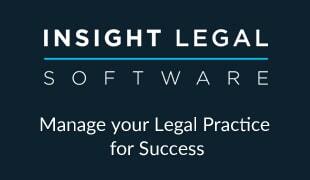 “[In-house legal teams] and law firms will have to master a number of new capabilities to maximise the chances for successful LSO engagements,” they said.